The “grand finale” took place in the Mint Pool Hall, located in Ketchikan near the corner of Stedman and Mission Streets. The Mint was a combination pool hall, card room and barber shop. “The place where Gentlemen meet and Headquarters for all Sourdoughs,” read an ad that ran in local newspapers. Matt held a mortgage on the building and liked to frequent the place, and that’s where he pulled a .38 automatic from his pocket and pumped three shots into his former accomplice, Phil Dohm, who died instantly. Matt placed a letter on the cigar counter. “Give this to my son Nick,” he instructed his friend Ben Schoen, who stood behind the counter. Then he turned the gun to his temple, pulled the trigger and blew his brains out, according to the Ketchikan Tribune of December 12, 1930. Immediately after the shooting crowds gathered along Stedman Street. Angry voices rose, demanding revenge and retaliation. There were those who hated Matt and believed he stood for pure unadulterated evil, and those who thought he was not so bad and even considered him a friend. As the two sides grew more violent, fights broke out and U. S. marshals patrolled the streets. They rounded up the men who testified against Matt, took them to jail and locked them up - for safekeeping! The telephone switchboard lit up like never before in Ketchikan. All available telephone operators, including the supervisor, worked all night fielding hundreds of calls. Everyone in town wanted to know what happened and express an opinion, pro or con. Although nationally Prohibition took effect with the passage of the Volstead Act in 1920, Alaska “went dry” with the passage of the “Bone Dry Law” in 1918. By this time Matt had lived in Ketchikan for at least seven years and knew most people, especially those in the underworld. He counted among his friends more than one or two government officials who could be bribed, either with bottles of booze or rolls of greenbacks. Wink, wink, and the officials happily turned a blind eye to Matt’s underworld activity—which in addition to bootlegging included gambling and prostitution, both of which flourished in his buildings. Clearly “the big Slavonian” had no problem breaking the law if it benefitted him and his bank roll. On the other hand, he was not completely evil; he had a few redeeming qualities. One was showing kindness to old fishermen that he met hanging around Thomas Street and the boat harbor. Many of the old-timers struggled to survive on next to nothing and had nowhere to live. Matt would provide a cabin or shack and charge only a dollar a year for rent. If a friend from “the old country”—Matt’s birthplace which was then called Dalmatia and is now part of Italy—needed a job or a business, Matt usually found him one. He helped Mitchell Bilicich and Tony Budinich establish restaurants, and Pete Lucey and Ben Schoen with jobs at the Mint. In other letters he expressed love for his father, his two deceased wives, and his son and daughter-in-law. In November of 1930 the law caught up with Matt. He and his accomplice, Phil Dohm, were arrested and charged with conspiracy to violate the National Prohibition Act. 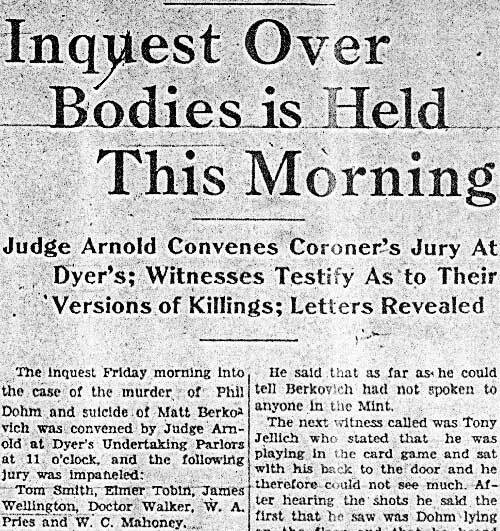 Shortly thereafter Dohm, in order to save his own skin, turned state’s evidence, joined the prosecution and testified against Matt before the Grand Jury. Collection Name	Wickersham State Historic Site. Photograph 1882-1930s. Other witnesses described the “cargo,” which was usually transported in gunny sacks. Sometimes, with U. S. marshals hot on their tail, the bootleggers would stash the “cargo” at some out-of-the-way cove and return for it later. Sometimes, if things were really hot, they would even—with much regret—be forced to throw the booze-laden sacks overboard! The newspaper also reported that during the trial Matt’s attorneys, A. H. Ziegler and George Grigsby, objected to almost everything that was offered by the government, while Stabler and Folta were on their feet constantly, objecting to everything put forward by the defense. What a lot of grand-standing and showmanship! Near the end Matt himself took the witness stand, denied every word that every witness said against him, and pleaded his innocence. But he was doomed. He could not convince the jury, the members of which had made up their minds and voted to convict him. A month before his death, Matt transferred all his properties (including the Mint, which he acquired due to a large unpaid loan to the former owner) to his son, Nick. 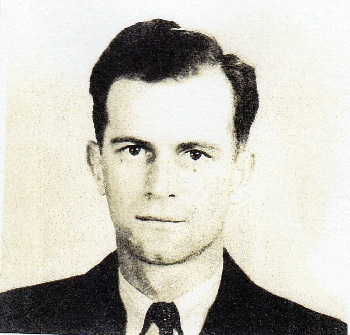 At the time Nick, 27, and his wife Edna, 20, were living in Tacoma, Washington. 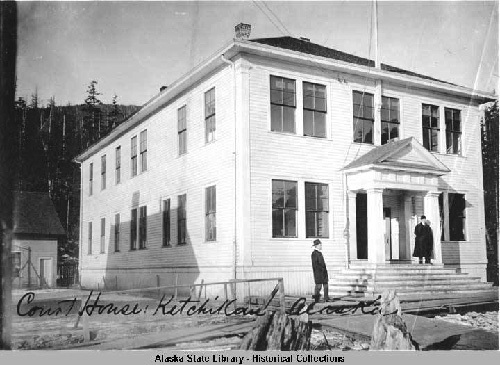 Upon his father’s death Nick and his wife moved to Ketchikan, settled into one of the Thomas Street houses and began managing Matt’s estate and properties. 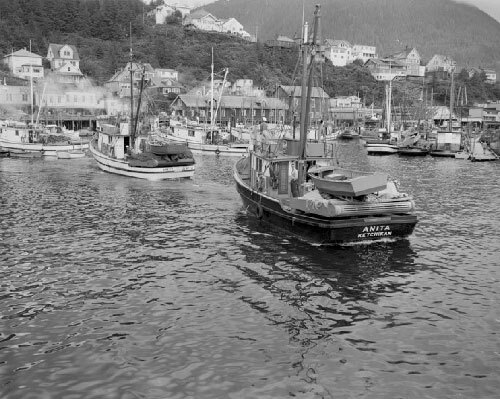 Seiners: Crest, of Seattle, and Anita, of Ketchikan, at Ketchikan City Float July 20, 1954 The photo shows the Anita backing out of her berth with Nick Berkovich's Crest and the Selma following. Unlike his father, Nick was no notorious outlaw. In fact, according to his family, he and his father shared few similarities. Nick served in the U. S. Marine Corps and the U. S. Coast Guard, attended church, worked hard and stayed out of trouble. 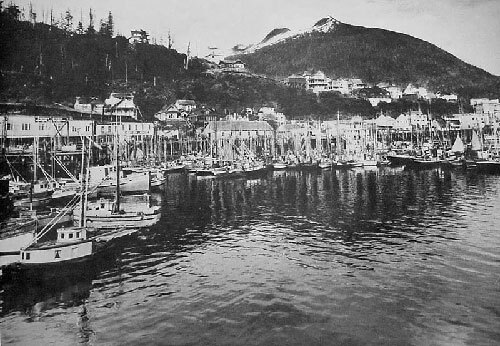 After moving to Ketchikan, he worked on his father’s buildings, shored up an old warehouse and web house, and bought more property to extend the Thomas Street wharf. He then bought a boat and became a commercial fisherman. In 1932 he and Edna started a family. Their first son, Matthew, was born that year, followed by Nick Jr. in 1940 and Larry in 1943. Nick strove to improve his neighborhood and community. In 1939 he spoke to the Ketchikan City Council about the “beer parlors, cocktail lounges and clubs along Stedman Street” that left their doors open, subjecting women and children to “vile language,” according to City Council minutes. He said that the clubs should be regulated and nighttime noise reduced. In addition, he let the council know that Stedman Street itself needed improvement - it was uneven, rutted and hazardous in places. Also, there were adjacent alleys and boardwalks that needed work. And some property owners should be fined for not maintaining their buildings and allowing them to fall into disrepair. As a fisherman Nick resented the fish traps that were owned and operated by big cannery interests. The traps caught thousands of fish, which not only depleted the resource, but made it nearly impossible for an individual fisherman to compete. Believing the solution was independence for Alaska, Nick joined the growing statehood movement. Give Alaskans control of their own resources! Nick Berkovich's boat, The BLUE EAGLE, ws used in the movie “Spawn of the North"
By now Nick was known as a property owner, political activist, fisherman and family man. 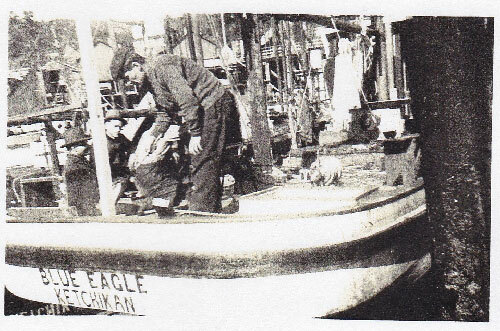 Another claim-to-fame came in 1938 when he and his boat the BLUE EAGLE were engaged to perform in a movie titled “Spawn of the North.” Set in the early 1900s, the movie’s plot revolved around salmon resources, fishing rights, gangsters and Russian pirates. The stately BLUE EAGLE became famous, and on a couple of occasions Nick even stood in for the handsome actor and film star, George Raft. In 1949 Edna Berkovich bought a home in Seattle and the family moved. Nick, however, retained his Ketchikan residency and much of his property. Although living in Seattle, he returned each year for the commercial fishing season. He did not retire from fishing until 1977. Ancestry.com, U.S. Census, 1910, 1920 and 1930. Berkovich, Debby. Various e-mails, 2006. Ketchikan Alaska Chronicle, December 2, 1930 and December 12, 1930. Ketchikan City Council Minutes, April 1, 1939; April 17, 1939; Dec. 3, 1941; and April 21, 1943. Ketchikan Tribune, December 5, 1930. Roppel, Pat. Research for the Stedman-Thomas Street Historic District, Tongass Historical Museum, Ketchikan, Alaska.